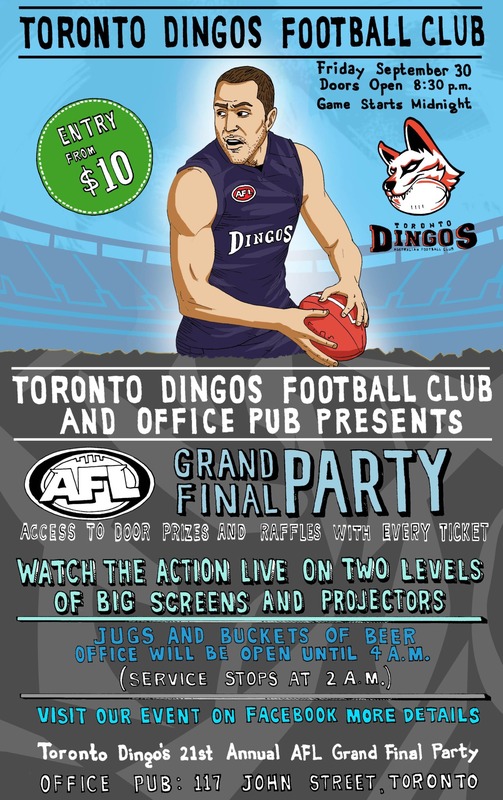 The Toronto Dingos will be hosting our 21st Annual AFL Grand Final Party on September 30th at a new downtown location: The Office Pub on John Street. 2016 marks a drastic change for the Dingos, as the previous 20 AFL Grand Final Parties were hosted at the now-closed Sports Centre Cafe. 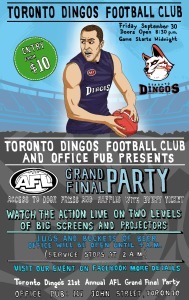 In what is sure to once again be the best AFL Grand Final Party in the city, the match will be broadcast on multiple televisions throughout the pub, while the club will be organizing raffles, giveaways and contests throughout the night. Doors will open at 8:30pm. Huge thanks to those who donated prizes to our raffle, including Left Field Brewery and The Australian Boot Company! Stay tuned to our website and Facebook page for further details as the night gets closer.